Thanks to our contacts in the Dunera community (still going strong after 77 years) for passing us their latest newsletter, dated October 2017. This edition includes a re-enactment, reunions and some interesting personal stories. For readers who don’t know, the Dunera boys were young internees, mostly Jewish, who arrived in Australia from England on the Dunera in 1940. They were interned here at Hay and Tatura and went on to make great contributions to this country, including in the forces. Earlier Dunera material links from here, including newsletters and Seumas Spark on Ken Inglis’s work on the Dunera boys. 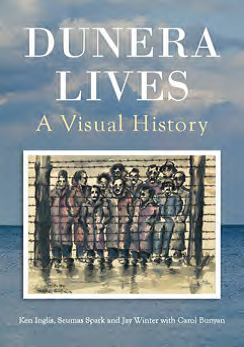 Dunera Lives: A Visual History, by Ken, Seumas, Jay Winter and Carol Bunyan will be published by Monash University Publishing in July 2018.